Arthur A. Levine Books, 9780545620857, 240pp. Once upon a time, two best friends created a princess together. Libby drew the pictures, May wrote the tales, and their heroine, Princess X, slayed all the dragons and scaled all the mountains their imaginations could conjure.Once upon a few years later, Libby was in the car with her mom, driving across the Ballard Bridge on a rainy night. 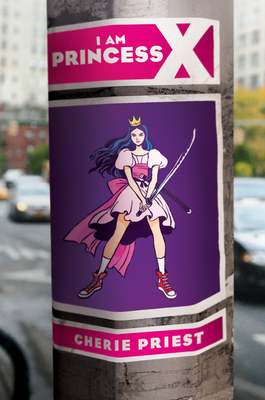 When the car went over the side, Libby passed away, and Princess X died with her.Once upon a now: May is sixteen and lonely, wandering the streets of Seattle, when she sees a sticker slapped in a corner window.Princess X?When May looks around, she sees the Princess everywhere: Stickers. Patches. Graffiti. There's an entire underground culture, focused around a webcomic at IAmPrincessX.com. The more May explores the webcomic, the more she sees disturbing similarities between Libby's story and Princess X online. And that means that only one person could have started this phenomenon---her best friend, Libby, who lives. Kali Ciesemier's work has appeared in the New Yorker, the Los Angeles Times, Ebony, Mental Floss, and many other publications. She lives in New York. Please visit her website at www.ciesemier.com and follow her on Twitter at @kalidraws.